To stand facing this piece by David Wightman is, at a certain time of the day, to stand facing the sun as it sets behind Brighton’s much photographed West Pier. Indeed, Wightman has given us a landscape every bit as sugary as the canvases for sale down on the sea front in what has been called the city’s Artist Quarter. The light is pink, the waters turquoise. This is what many people expect from art, a real life scene with an exaggeration of light effects and a strange beauty. But Wightman’s scene is not real life. It is a composite or a chimera. He takes postcards and begins to invent. He draws cartoons in the classical sense and works up monumental paintings. Except nor are they paintings. 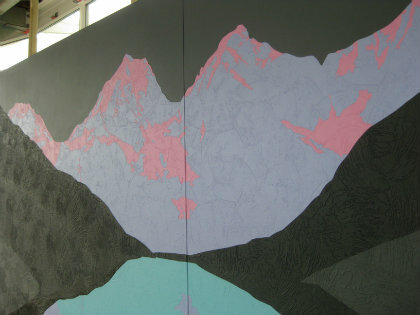 His works are made from highly textured, precision cut wallpaper. They might be called collage, but only to the degree that a late Matisse would be a collage. Brighton’s HOUSE Festival celebrates art with a relation to domestic space. And the wallpaper does indeed tame this sublime and fictionalised landscape. And yet you would need a big wall to host Hero. It dominates the small glass pavilion in which it finds itself and is presented several inches from the far wall, giving emphasis to its materiality. This is not what people really want from a landscapes above the fireplace. And indeed the artist points out he has more in common with Bridget Riley than John Constable. His acid colours and fragmentary shapes play with abstraction. But at the end of the day, we are too familiar with picture postcards to avoid the representational trappings. Mountains and cabins and tarns and snowfall: these are all tokens of beauty. We bring them indoors as pieces of art and, in the light of Wightman’s giant pieces of décor, that is a strange convention. Hero can be seen in Brighton’s HOUSE Festival until May 26. See housefestival.org for more details.